Researcher Marie-Ève Maillé discusses her legal battle and the lessons she has learned from it. Marie-Ève Maillé is the Quebec researcher who fought from 2015 to 2017 to preserve the confidentiality of her PhD research data. She was ordered by the court to hand over her data in the context of a class action suit by citizens against the Éoliennes de l’Érable company, in which she had agreed to appear as an expert witness. The Superior Court finally ruled in her favour on May 31, 2017. While she was still engaged in the battle, Dr. Maillé, an associate professor at Université du Québec à Montréal, recorded her thoughts in a book, L’affaire Maillé, by Les Éditions Écosociété, published in October 2018. University Affairs: What prompted you to write this book? Marie-Ève Maillé: I realized that what had happened to me could happen to anybody. I told myself that keeping track of the battle I was engaged in could help others take the right steps, and look for certain kinds of help more quickly. Also, writing the story was certainly cathartic. 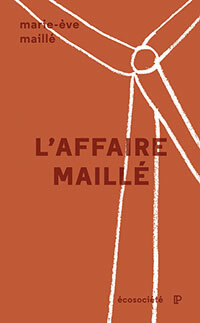 The “Maillé affair” was something that happened to me – I don’t feel that I chose the course of events. I needed to write down what happened to take back some power and become an agent in the story. Lastly, I wanted to express my gratitude more formally to my two attorneys, Bodgan Catanu and Laurence Ste-Marie, who represented me free of charge in the case through the organization Pro Bono Québec [Editor’s note: now Justice Pro Bono]. I felt it was important to thank them for their extreme generosity. UA: What lessons have you learned from this whole story? Dr. Maillé: From a scientific point of view, I learned that as researchers we are sometimes negligent of our ethical commitments. The research community fails to grasp all the implications of being in contact with citizens or groups who find themselves in situations of conflict or controversy. I think that, very often, scientists see ethics as a nuisance, one more step in a research process that is already long and tiresome… I believe that researchers and institutions all have a responsibility to reduce these risks for those who participate in research. As researchers, we have access to places and people that even the media don’t have access to, this comes with a responsibility. I recently submitted an application for ethics approval, and I have never had such pleasure in doing so! I felt extremely involved, and did not take any undertaking lightly. This forced me to think about a number of things: how long do I need to keep my data once it has been transcribed or anonymized? I forced myself to make a commitment to my research subjects that I would always be aware of the risks I was exposing them to. The confidentiality of data was recognized in my case, but it always needs to be defended on a case-by-case basis. The principle has never been definitively stated in within the law community. There is always an angle that can be used to again raise a question that was thought to have been settled. UA: What would you do differently if a similar situation came up again? Dr. Maillé: My main regret is that my thesis is no longer part of the evidence before the court. My PhD was a particularly trying experience. Three years later, when the citizens from the class action suit asked me whether they could use my thesis, I saw it as a way of giving some meaning to the difficult process I had been through. If I had succeeded in protecting the confidentiality of my research data from the outset, my thesis would probably still be part of the evidence. UA: What advice would you give to anybody facing a similar situation? Dr. Maillé: You must have a lawyer working for you who will defend your interests (and not those of your research institution). Today the law is highly codified, and is based on rules and procedures that are set out in minute detail. Next, you need the support of strategic allies, because you must not wage this battle alone. In the current state of university governance, you also need to make sure that the battle is waged in a public space, with media exposure. These problems are social and political, and are highly strategic for our research institutions. The “judicialization” of disputes has the effect of moving a dispute that is political and social into the courtroom. This gives other advocates in society the impression that the issue is no longer their concern. But my battle was not merely my concern. It had consequences for anybody involved in doing research. UA: Have you been following the case of Chantal Pouliot at Université Laval? Dr. Maillé: Absolutely, she is currently going through a similar experience: citizens whom she had emailed about her research have been asked to hand over the correspondence. In fact, Chantal Pouliot was a valuable ally in the “Maillé affair.” She is the person to whom I talked most about my case, and she also wrote a letter of support. Fortunately, because of what I experienced and my account of it, her reflexes are already a little sharper than mine were. She has taken more strategic steps: when an attorney talked to her about the case management conference, for example, she knew what it was, because I explained that in my book, and she understood its importance. It was during a case management conference that I was ordered to hand over my data. I could have had representation at the conference, but I didn’t know that. In Chantal Pouliot’s case, what particularly disturbs me is the very close relationship between the boards of directors at Université Laval and Le Port de Québec: both boards are chaired by the same person. That poses serious ethical problems, particularly when there is a dispute involving both institutions. This raises important questions regarding the governance of our universities: how is it that people who are essentially economic players, have such a big role on the decision-making bodies of our research institutions? UA: Does all of this make you want to turn away from these subjects? Dr. Maillé: On the contrary. I got involved in the struggle of Grenville-sur-la-Rouge, a small municipality in the Lower Laurentians being sued by a mining company for $96 million. I am not willing to deprive the public debate of the expertise I have developed over two years, which now includes firsthand experience of the legal system. If my expertise and my testimony can serve the public debate, remaining silent would be tantamount to playing these companies’ games, which I refuse to do.